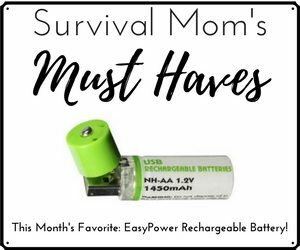 All right, Survival Moms, what one thing do we ladies always have within easy reach? Our purses, of course. Most of us have preparedness items at home, at our BOL (Bug Out Location), and in the car. But if we’re in the mall or at the park when an emergency situation occurs, our purses should contain the resources which will help us survive and enable us to reach our next level of preparedness. While the list looks like quite a load, it actually takes up minimal space because many items on the list are things most of us already carry (mirror, pill box, Kleenex, writing pad, pen/pencil, cash). The comfort/entertainment items are things I carried long before I knew about “prepping”. The items specifically for an emergency are in a small makeup bag (whistle, flashlight, pill box, Swiss knife, medical supplies, Bic lighter). Food and water are the most difficult to accommodate in a purse. I carry Ritz crackers because they’re inexpensive, easily rotated, packaged adequately, and I like them. I’ve carried water in a small plastic bottle, but it sometimes leaked and was awkwardly shaped. My solution was to use an object designed for carrying liquids in tricky places: an ordinary stainless steel flask, available in sizes from 4 oz to 18 oz. It’s easy and inexpensive to refill once a week. The purpose of my purse survival kit is to enable me to meet immediate needs if an emergency occurs while I’m away from my car or home. As long as I have my purse, I know I’m prepared not only for big disasters but also for the little bumps of life. Over the years I’ve needed most of these items at one time or another: a thunderstorm once knocked out the lights in the theater and I was the only person with a flashlight, new shoes rubbed a blister and I had a Bandaid, a two-hour wait in the doctor’s office was less miserable because I had the crossword puzzle book and the crackers. The Swiss army knife has been the single most useful item I carry. I’ve used it to cut threads, pull out splinters, tighten glasses, and file broken fingernails. The dangers of our modern world mean we must always be in a state of readiness. This readiness isn’t adequate if it’s confined solely to our home, BOL, or car. Preparedness means “all the time”. 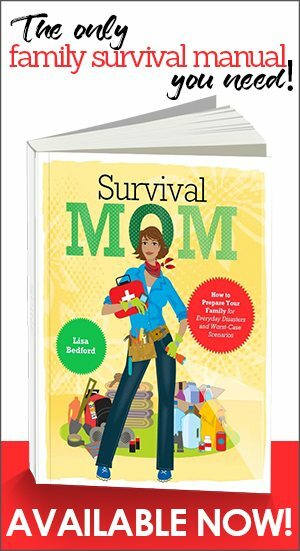 That will truly make each of us a Survival Mom. Note: I extend deepest gratitude to Rangersquirrel for explaining modular survival levels and thereby giving a name to something I was kind of doing but had no name for. What a great list. It makes me feel prepared that I already carry around some of these items, but I do need to improve on some of the items, such as small bills (they tend to spend themselves, somehow) and water. The flask idea is brilliant and I saw flasks just this morning at the grocery store. I have seen in the Dollar Store zip up cases for eye glasses, if you don’t want or don’t have room for a cosmetic case in a small purse. I carry a lighter, pocket knife, nail clippers, two “light day” pads, bandaids, a couple of alchol pads for fire starters and an Altoids “tiny tin” with part of a crayon for a candle, another alcohol swab, two single edge razors, dental floss, two fishing hooks with eyes that the floss will fit through. I take the floss out of it container to fit better. I was in San Francisco on a bus several years ago when a women got on with a bad cut on her finger. As a mom of boys, I carry a tube of Neosporin and a selection of Bandaids all the time. She was quite surprised to have a passenger glob some Neosporin on her finger (yes, I asked first) and then give her not just a bandaid, but specifically a knuckle one at that! So, I agree with you that, like most prepping, these things can come in handy at the most unexpected times. Make sure that flask doesn't slide out of your purse while you're in church! : ) I did that once with a pistol. Purse sitting on the floor near the isle tipped over, and gun plopped out on the floor for all to see. I picked it up and ignored it. So did everyone else, surprisingly! That whistle you carry, affix it to the handle or shoulder strap by a little chain where it's quick to grab. No rummaging to find your defense items. I quit carrying a purse because I heaped it full of useless junk, but I may make up a minibag with these items in it and carry it like one! I love to hear what others keep in their "every day carry" kit. I've learned a lot about what is useful and some good products just from these kinds of lists. 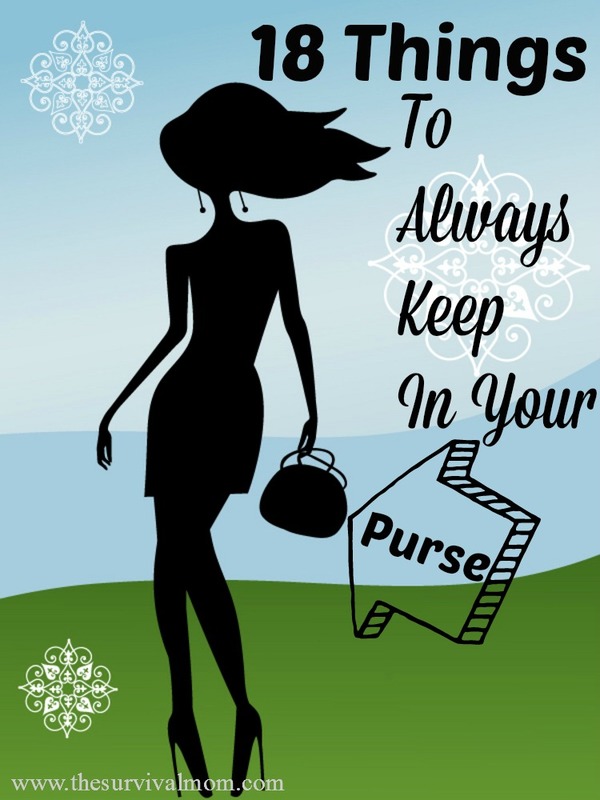 Good list – some additions for my purse. Very good suggestions! Are you trained to use that baton? Another item for self defense you might consider is a tactical pen. This is a great list for several reasons. Mainly, it’s nice to see someone who agrees with me <g>. But since a kit containing this really gets down to the basic level it should carry the basic supplies for every single person to have access to 24/7. As terror attacks ramped up (WTC 1993, 9/11, London subway etc.) around the world over several years I was struck by pictures of the survivors, many of whom were coughing, choking, and dirt smeared. As a result I put together my own ‘Urban Survival Pack,’ containing several things which would be useful. It contains most of the things in your list, (although I shorted the Comfort/Entertainment items). I added two items I really considered significant – a plastic poncho and an N-95 face mask and a triangular bandage to serve as bandage, bandana, sling, etc. I also chose to carry about 8 ounces of water, but I chose the mylar bags used by the Coast Guard. The addition of the face mask and poncho were based on the desirability of being able to walk away from a ‘dirty bomb’ explosion and other disasters without coughing and hacking. This report noted that the main goal of the individual response to a dirty bomb attack was to avoid contamination of the lungs by radioactive particles (dust, dirt) which result from the explosion. The easiest way to accomplish this would be to put on a face mask (and poncho to keep radioactive dust off the clothes and skin), walk at right angles to the wind, find one’s car, and leave, take off the poncho and wash thoroughly. This is logical, and the report confirmed that this is a great response. Instead, the report urged sheltering in place, with windows and vents closed until emergency responders could lead you to safety, even to the point of going indoors if you were outside at the time of the blast. I had to read the entire report and the appendices three times before I understood the unstated… people would never actually prepare for such an event, even to the point of actually buying and carrying a simple face mask, therefore the general population would not be able to take these simply steps for survival. Under those circumstances the only other possible group solution was to huddle together and wait for someone to come along. I prefer not to be part of a "second choice" solution. By the way, this kit fits nicely into a zipper plastic freezer bag, and the bag fits nicely into my wife’s purse, my jacket pocket, a backpack (think of it as a school kit) as well as being the core of Bug Out Bag supplies. And don't forget to add tampons to your list! Men too! Besides the regular obvious use, they can be a first aid life saver! Recently, on a camping trip, a woman tripped and fell on the hiking trail, cutting a large gash in her leg which started bleeding profusely! Our 6 ft. plus Camp Director whipped out some tampons from his backpack and had the woman hold them against her leg she could get proper medical attention. Those tampons did their job!! And with a small tube of vaseline, they can be used as fire starters! They are small and light to carry in a purse, pocket , or backpack! All great suggestions, and good to know that I am somewhat prepared. I would also add aspirin to the list of meds, in the the event of heart attack, or it could be used for other ills. Wow, I'm totally a bad mom! I'm going to take this list and go shopping. My mom-bag includes diapers, an iPhone, one bottle (no matter how long we'll be out) and a book. A book for me. Okay, I'm not the guilty type, so I'll get over it… Okay, I'm over it. But still, I need to beef up the mom-bag. I live in Nevada, and work 7 miles from home, 10 minutes by road 45 or so cross country. My jeep and my car are both kept stocked with extra water (gallon and personal), pulaski or small shovel, light weight shawl/scarves, a variety of hats, gloves and extra socks and an extra pair of shoes. My purse has most everything on the list but I will be updating that asap. By the way, would you say that a mini leatherman work as a good substitute for the Swiss army knife? I have that and a mini (4") pocket knife that never leave my purse and a large leatherman in my jeep kit. A few days ago on your “lists” section there was a list of many items to have in case of an emergency. It had been printed by another person several years ago. One item listed was a generator + many others. It is no longer on your website!! Where is it? Would you put it up again as our printer was out of ink and we were unable to print it and we would like to do so now. You can put your crackers in a hard-sided and hinged sunglasses holder. You might fit two in there, maybe some nuts too. Now they won't get crushed. Great list!! I need to pull together this mini-kit. Diabetics carry a mini/small meter and extra lancets and test strips. If you have an ostomy appliance 1 or 2 changes of supplies including disposal bags,in a tote bag of urinals[hospital/medical supply store,male & female] male for emptyingpouch,female for the obvious,small bottle of water to rinse pouch,tissues/paper towels to clean tail of pouch,towels to cover door windows[privacy],small trash bag to cover seat in case of a spill, anti-bac wipes for cleaning hands. If you get stuck in a traffic jam for hours,well this is a lifesaver for me in the floor board. everybody knows what you can go through at airport security checkpoints,now add hospital ER's. They took my mini Leather man tool,my mini swiss knife and anything else they consider a "weapon". I've carried these forever on a key ring. Actually came close to panic attack. Just be warned people. I have read a lot about guns, etc. 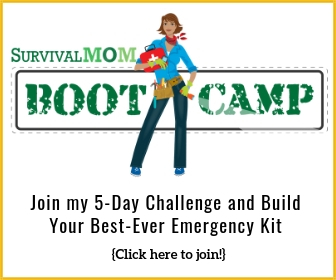 on prepper and survivalist sites. But I have yet to read about pepper spray. I actually used it once, to great effect. I lived in Miami and commuted every day on the public transportation system. One afternoon, I came down the elevator from the Metrorail (raised rail system) and when the door opened, there was a man who said "Give me your purse." Well, I always travelled with a pepper spray right in my skirt pocket with my hand on it. I pulled it out and shot him in the face with it. I missed his eyes (probably useless with a gun, anyway) but did hit his cheek and he ran. I went back up to the platform and hollered after him, jeering want some more? I would really recommend this for any one living in a city or town environment and I think the whistle is a good idea too. But now that I live in Texas, in a more rural area, I am thinking of getting one again. It could be useful answering the door. Even with armed marauders, you have the element of surprise and the stuff is really potent! Unless they have heavy artillery (in which case a handgun isn't going to help much), it could really make them run! Let's see… I have a swiss army compact, a swiss army memory stick, a paracord bracelet(i use it as a key chain), two small flashlights(one cheap dollar store led, and a mag-light solitare) my grandmothers zippo(its from the 50's, )enough over the counter meds for a small army, a really nifty bandana, a whistle, bandaids, paper and pen, you name it… I have it, and it's all in a purse that is no bigger than a small lunch box. Oh and my water bottle is reusable and has a built in charcoal filter. Several weeks ago I made up my every day carry following the "18 things to have". Yesterday I travelled in a train as a young muslim woman approached me and asked: "Do you have any Aspirin by chance. My sister has got terrible belly ache". So I pulled out my little food container I use and gave her an Aspirin. She was so grateful and said: "I should make up such a thing myself"! What else have I used: On a ride with the car we saw that the gas prices had dropped significantly. Since neither of us had any card in the pocket, I payed out of the cash reserve. Ibuprofen for back ache. Knife for opening one of these incredible blister-packages. Alcohol wipes for toilets a lot. Lamp on the key chain when I am on call during nights in the hospital and have to cross the area between different houses. You can find your way but not the key holes in the dark. Awesome! Preparedness isn't just for the end of the world and zombies! Not for your purse but good self defense is wasp spray. Think about it! It will shoot 20 – 30 feet. You don't even have to get close to shake up an intruder enough for you to escape. Keep a can close to your bed and also where you watch TV. With so many home intrusions these days, it may help send the jerks running for their lives instead of taking yours. And germ-x Lol im thrteen and i carry a bunch of junk to lol i am cleaning out my purse and makeing a mini shopping list . I usually carry a knife and my wallet and book with me . In additon to the OTC meds you mention I would suggest a couple enteric-coated aspirins. A life saver in the event of a heart attack. I need to correct that. Not enteric-coated because you need to be able to chew it so it will act quickly. I would add a small sewing kit to that list. You don’t need much I made a kit in home-economics out of a few different threads, 2 needles, a safety pin, button all wrapped or taped onto a small piece of thin cardboard. I’ve also used sewing kits from hotels. A small sewing kit has come in very handy, just the other day while in school (college student here) my tank top strap broke because some little plastic piece broke. I didn’t have to worry I just got my EDC bag out of my purse got the sewing kit out & took the safety pin out and fixed my strap. My EDC bag is a makeup bag I got for xmas it has all my essentials in it from perfume, pill box, nail file, my asthma pump, and most of what’s on the list above. So when I switch my purse I simply take that bag out and move it to the new purse. It couldn’t hurt to have an extra phone charger in there. The flask or stainless water bottle could hold a lot of the small items on the list, saving space. Individual peanut butter, like you see on a hotel buffet, would offer more protein, calories, and nutrition than peanut butter crackers. I am new to this site. I love this list, and the comments are excellent too. I live in the city but have always carried certain things in my purse or bag. Having small, lightweight items is essential, because We often travel without a car, on foot or bicycle. In urban areas, it is easy to think that everything is always available in nearby stores, but you just never know and should have certain things, especially with kids. I love the idea of a simple flask for water! I have always struggled with the bigger water bottles on short trips. This past summer, I know many people who were stranded underground on the subway for two or three hours at a time in the heat, no AC. Happened on two different occasions. That is an example of a time when you want some water and food and maybe some entertainment! I would add energy bars to the list. Crackers and peanut butter are great, but if you are in a rush, energy bars are available in many places and will tied you over. Thank you! Throw in a couple of mylar space blankets..they don’t take up much space, but they can save your life. Cold outside – wrap up. Use as heat reflector. I would suggest using small empty Altoids’ tins and making a sewing kit and another with several fishing hooks and fishing line. how about an emergency survival blanket. Love your list and will be adding to my bag tomorrow. Use a dollar store hard sided glasses case to keep crackers from crumbling. I don’t have half of this stuff. It’s ok. Doesn’t make one a bad mom. Why not take the weight out of that purse? Think of your life. Make categories ie. Sara, Felix, mom ,dad, dog besides some of those categories she listed above..You should see my trunk. Gloves, work, non-latex, etc. Tissues , toilet paper, towels. Rope, chain, bungee cords. Travel needs: toilet paper (when a roll is getting altitle low, I change it and pack them for emergency stops, smaller ones can be carried easier too.) paper plates, napkins, decent ones, plastic, reusable , spoon, fork, knifes, plastic bags for garbage, 1 bag with warm soapy wash cloth, or wet ones, 1 bag with soft drying cloth or two. Boots, extra shoes, underwear for all, anti diarrhea pills, medicine. H2O. Gum, candy, protein bars or drinks. Life is busy, appointments run ov r r or long. Books , puzzles, doodling pad to help patiently wait. Patience is a gift…use it to develop it. I changed it according to the season. Be safe, good luck, God bless! I would add a few things … Instead of ritz crackers I would use some type of oackaged electrolyte and protein source/energy which would take your body or that of your child’s much farther then um… The nutritional value in ritz crackers lol also cayenne pepper can be carried in sandwich bags or a travel shampoo bottle etc… It will stop massive bleeding instantly – btdt a bunch of times with kids , hubby and myself in remote locations …. And no it doesn’t sting, a small bottle of dr Christopher’s cayenne tincture will also take you far and just might abort a heart attack or stroke as can the powder …read up on it 🙂 arnica 200c or 1m works amazing for shock ! Phone card doesn’t hurt either in case cell networks are down or you are in a different city , assuming land lines are operational. Small bottle of lugols iodine can purify water and disinfect cuts and gashes…..
your drivers license or ID. Your insurance cards in case of an accident. A calendar for writing appointments, etc. I’m just back from a doctor visit and needed every one of these items. When I was working I had a small plastic case, like they have in the dollar store. I had many of those things and more. More than once people where surpised that I had screw driver for my glasses or nail clippers. 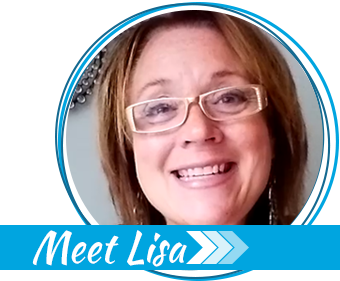 We had a lot of other things because, we worked in a group home, but my emergency kit helped me with small emergencies. I love your list and reminds me to update my purse. I love the idea of a survival kit. I carry most of these things anyway. The emergency blanket is a great idea – and they weigh next to nothing! I also carry one of those tiny pots of vaseline for my lips and a couple of individual sized packets of powdered drink mix – I absolutely hate water! There were only a few mentions of a cell phone. My phone case is also my wallet and is loaded with many, many useful prep items. Besides the phone; it’s my address book, clock/timer, game player, map, compass, note pad/pencil, MP3 player, photo album, camera, video/voice recorders, calculator and books including First Aid and SAS survival. I am adding new apps all the time. Two items that I consider necessities LOTION and CHAPSTICK. Dry and cracking hands and lips are major openings for infection and very annoying especially if you’re stuck without something to soothe them. And I don’t know about anyone else but about the time I realize how dry my hands are it’s because I’m stuck somewhere with nothing to do and my hands start to itch.. and then it’s a constant irritant. You can even get small lotion bars these days which makes it much easier to carry lotion in your purse.. keep it in a ziplock baggies because hot days can melt it somewhat. But way less risk of mess than a liquid lotion coming open on accident.